There are so many still water fisheries nowadays and they are great fun, making fishing accessible to everyone whether able or less able, young or not so young. Some fisheries are small, some are big and so many have double figure fish that scare the heck out of you when you take them on a single handed rod with 4lb line and a size 20 hook. The number of youngsters you see on fisheries is heartening for the future of the sport and one can only hope that they stick with it and try the challenges of wild water and other species. My favourite still water fishery fish is the Blue. I first encountered Blues at Chiphall in Hampshire. Typical of the area the water is gin clear, so much so that as a person who suffers from vertigo very badly, I got dizzy standing near deep water! You can see the fish moving right down to the bottom at Chiphall and you can see the take. With Blues the next thing that happens after the take is to see the fish surface twenty yards away with your fly line at 90 degrees to the point that it enters the water. They look like grilse move in the blink of an eye and fight like fury. Many Scottish fisheries are in quite natural settings, a cut above the man made pond where fish can over winter well and grow on. 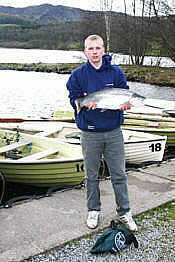 Some so big they need loch tactics, called fisheries because they are heavily stocked, but still challenging. Off course most fisheries are a bit alien to anglers who prefer fishing on the wild side, less physically challenging, an acre or two of well stocked water. The flies that are used on still water fisheries are, in some instances, objects from alien planets but even for the more pure at heart the free rising rainbows offer some first class dry fly challenges, and there is no doubt that the technicians on fisheries have contributed massively to the development of tackle, tactics and flies. Fisheries are sociable, what fishing isn't, and they are generous, for it is a bad day indeed when you go away with a blank. Great for beginners and fun for the experienced, they are well worth a visit and many are open all year.